All packed up and ready to travel. The two icons have been completed and varnished. They will be packed tomorrow for their ferry journey to the Mainland on Monday morning. I got the two halos gold leafed over the last few days, allowing for 2 days setting time before burnishing and varnishing them today. I am now in the final stretch of fine tuning and doing the faces etc. All going well, I am aiming at having the icons completed within the next two weeks, and varnished. I've been working on the background colours, painted borders, and adding the first coats of oil base gold size, which needs to fully dry and be sanded (twice). It provides a smooth hard finish for when it becomes time to apply the gold. 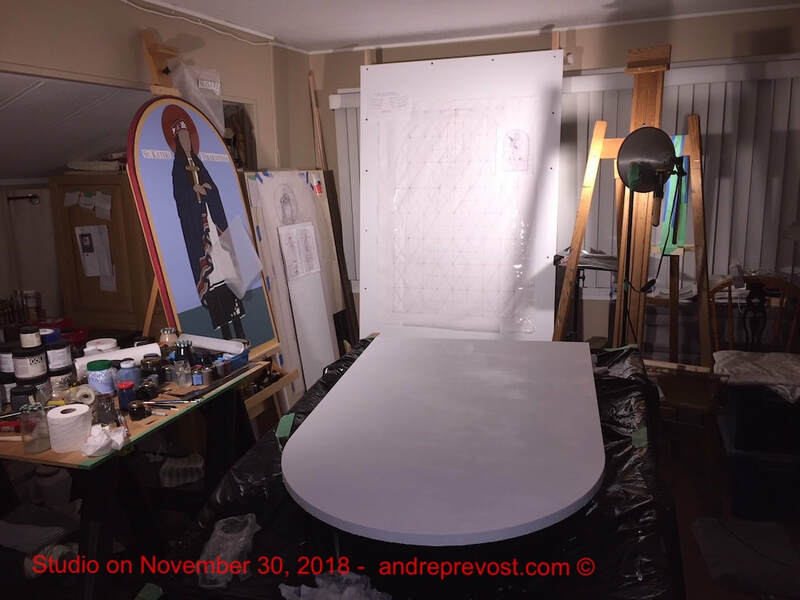 I have my handy cardboard box which I use for all the halos in this project, protecting them until they are dry enough set upright once again on their easel. This also allows me to continue working while the adhesive sets. Passed the last few hours making another batch of the Dark Salmon colour for the icon frames. I needed to match it as close as possible to the colour of the 3 completed icons. It isn't critical if there be a very slight variation in the shade because of the space between the icons, each within its own painted niche of the Naive wall. But I had to mix enough of thise batch for these two icons and the 3 to follow. Salmon is a challenging colour as it requires a number of stages and colours, all the while trying to avoid too much waste. Well, the waste isn't a huge problem as any colours that disn't work are always useful in other icon projects; the great thing about high quality acrylic paint. 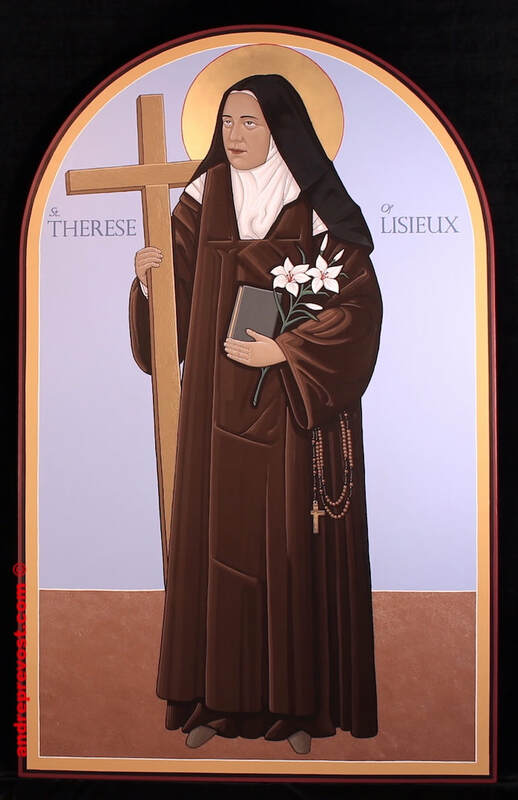 It's been a long few days but the designs for St. Therese of Lisieux and St. Mother Teresa have been confirmed. Both have been drafted to full scale, transferred onto the new panels, inked in, and had some negative space base colours added (to break up all the white surface). My workshop yesterday (sanding #1) during a break from the snow warnings. The hummingbird wasn’t impressed. My fingers were pretty cold by the time I was done. I need to do sanding #2 today, after adding 4 more coats of gesso, but we have another snow warning for this afternoon. It was -8 C earlier. The reality of applying muslin. It is fast precision work. There's a reason plastic is required to protect the floor. 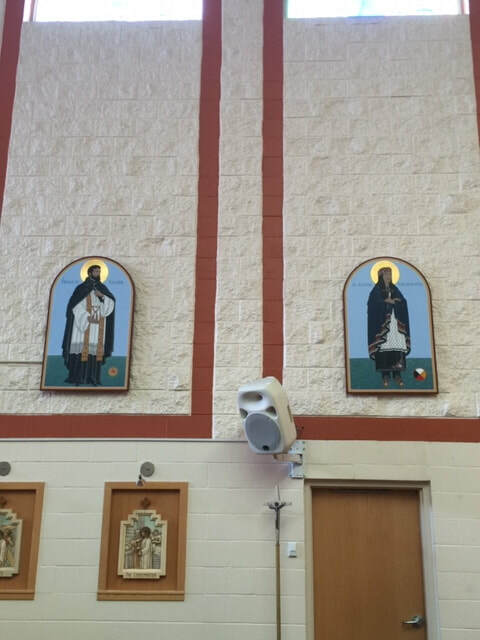 The two icons have been installed in St. Monica's Church. 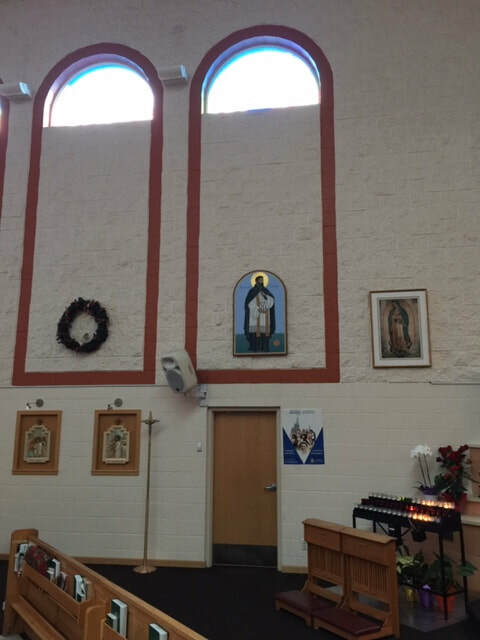 The icon of St. Kateri Tekakwitha joins St. Francis Xavier on the west wall, and the icon of St. Lorenzo Ruiz in on the east wall. The icons have been delivered, and with seconds to spare, I got back on the same ferry back home. Now it is time to continue work on the next 2 designs, and the messy preparation of the panels. 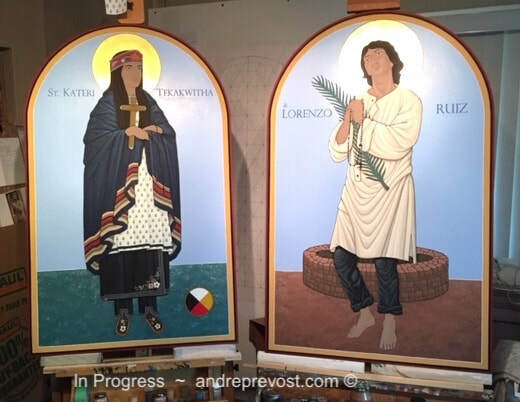 The St. Kateri Tekakwitha and St. Lorenzo icons are completed, and being varnished. Both are being delivered via Duke Point Ferry this coming Monday morning. The icons are 30" x 48" x 1". Bear with me. the two icons are moving forward, although a bit more slowly then originally scheduled, thanks to the thumb/wrist injuries form debris clearing after the wind storms, and the cold from not being able to split wood for the wood stove. But the wrists are improving. 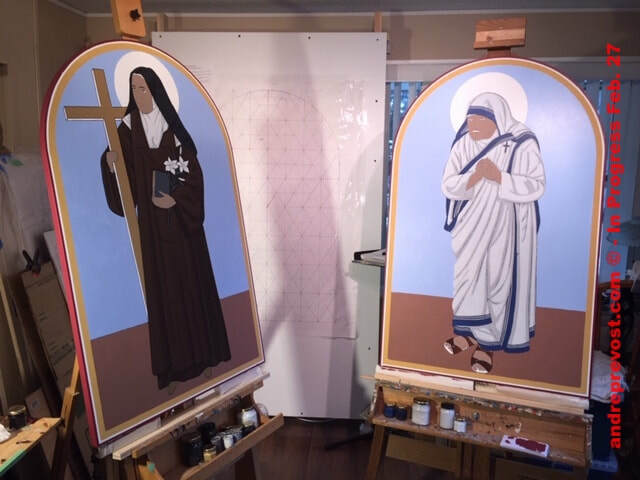 It was arranged with St. Monica's Parish to delay the delivery of both icons until February 4th. A good thing as I decided to redo a few things within the icons. This weekend will be busy, and my plan is to be completed by Monday. I need to get the icons varnished by Wednesday, to get them lots of drying time before I pack them on Sunday, February 3rd. I'll be packing them face to face within the one box. My 2-wheel dolly, although light weight, is rated for the overall weight. I will be carrying them onto the ferry at Duke Point. I should be able to post pictures of the finished icons early next week. I am also working on the designs for the next two icons: St. 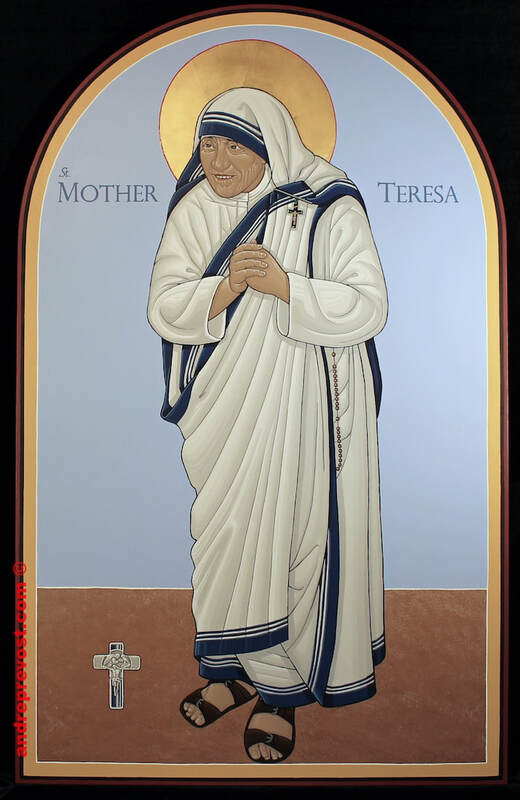 Mother Teresa of Kolkata and St. Theresa of Lisieux. The care will be the preparation of those two panels; adhering the muslin which requires fast work, and then all the sanding. The round arch tops are the going challenge. Work on these two icons as come to a stop, thanks to the terrible storm that went through last Thursday. The icons had already had some delays due another wind storm the week prior. But this recent storm devastated our mobile park. Fortunately for my mobile home, the large branches missed, but my lot was covered in debris from the Fir trees. I've also hurt my left wrist and thumb joint with cleaning all the debris out to the front curb, before the park picked everything up. I've alerted the parish about the now compromised January 10th delivery deadline. It will now be around January 28th. We had no power since last Thursday, until late Christmas Eve, so I invested in a generator Saturday evening. It helped with the basics, but food spoiled in the fridge and we had no way of cooking. Christmas Dinner was McDonalds take out as it was the only thing open on Christmas Day. My son and I had a nice Christmas, all things considered. Weather forecasts say more storms are on the way tomorrow. Hopefully the weather won't make my trip to Duncan difficult tomorrow, as I need to venture out to replace some of what was lost in the fridge, and get the groceries for our actual Christmas Dinner which we will now hold on New Year's Eve. Blessings of the Season to you all, and nothing but the very best for you in the New Year. 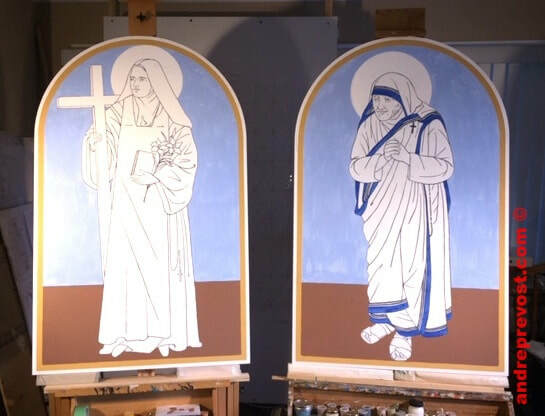 Time for another update for the St. Monica Icon project. There have been a few delays, with computer issues and the recent wind storm that required clean up. But the two icons are moving forward. 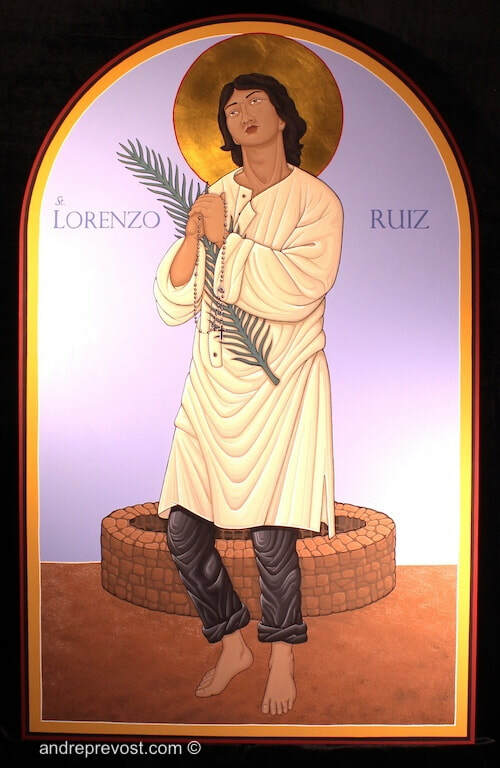 I now have the St. Lorenzo Ruiz icon pretty much at the same stage as the St. Kateri Tekakwitha icon. This way, I can continue developing each, alternating from one to the other. With Christmas coming on, even though I do plan to work through much of it, other then preparing our Christmas Dinner, I figure that the icons will be completed in early January. Update: It was confirmed today that the delivery deadline for these 2 icons needs to be January 10th! So the push is on. Fortunately, I had already planned in working through the Christmas Season. I completed preparing the panel for St. Lorenzo Ruiz' icon over the weekend, and started drafting the design into its actual scale onto tracing paper, overlapped on the grid pattern which I've set on a drawing panel for all 8 icons. Once I had this done, I transferred the tracing paper onto the panel. But before I could ink in the design onto the board itself, there were corrections that I need to do. It is always better to do these corrections on the tracing paper because pencil graphite is next to impossible to erase if done on the gesso, and it can also leave line impressions. Once done, I transferred the design on the panel using a sheet of graphite under the tracing paper. I've blocked in the main base colours for the background as it helps determine the colours throughout the icon. Because the stain glass windows above have a seasonal them for each wall, the ground for the St. Lorenzo will be a russet colour. His icon will be installed on the opposite wall from St. Francis Xavier and St. Kateri Tekakwitha. The icon is now at a point where I can return to the St. Kateri icon. The plan is to get these 2 completed at the same time, so that they can be delivered together. Mind you, it will test my small 2-wheel trolley as the 2 will weigh around 70 lbs... I would never be able to carry these icons with the trolley. Before I continue with the St. Kateri icon, I need to prepare the 3rd panel, and transpose the design for the St. Lorenzo Ruiz icon into actual scale. So needless to say, given the limitations of my studio space, aside from having everything underfoot, I'm always having to move things around for each step. Tomorrow morning, I need to find a place to put everything on my work table in order to free up those 2 saw horses for the porch. It's forecast to be 5C tomorrow, so it will some cooler sanding. The sanding needs to be done outside to avoid as much dust as possible, especially with the Christmas Tree scheduled to go up sometimes next week. Once I get that sanding done, I add 3 more coats of gesso, let dry, sand again, and then one more round. The picture below gives you an indication of trying to work on 3 things at one time. Lots of sidestepping and carefully stepping over things. Received a few pics from Father Wong. 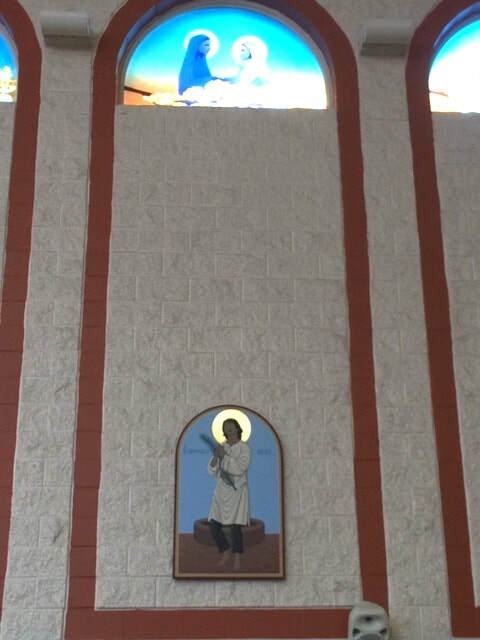 The icon is already installed at St. Monica's, well in time for St. Francis Xavier's feast day. The St. Francis Xavier icon was delivered to Father Wong at Tsawwassen Terminal yesterday. I crossed over as a foot passenger. It was another fast delivery as I was catching the same ferry back home. I am most thankful that the weather cleared as I arrive to the Duke Point terminal and remained perfect for the trip to Tsawwassen, right up to the moment the icon was set in Father Wong's car. As the ferry was leaving once again, the clouds moved in once again and we are now back in the rains. The BC Catholic was hoping that I could get a picture of Father and I at the delivery, but there just wasn't a moment to spare on this trip. I'll have to schedule in 2-hour wait the next time, for the next ferry home. Now it is time to return to he St. Kateri Tekakwitha icon, and begin designing the St. Lorenzo Ruiz icon. That will be the next panel with I will need to prepare with muslin and gesso. Fortunately, my small porch is covered, given the cooler rain season upon us. There will be a point this season where we will also be getting some snow. But my only option is to do all the sanding outside on the porch. The gesso dust is deadly when indoors. It covers, and gets into everything. The St. Francis Xavier Icon is completed and I'm gradually adding the varnish. It will be packed on Monday afternoon, for transport via ferry on Tuesday morning. 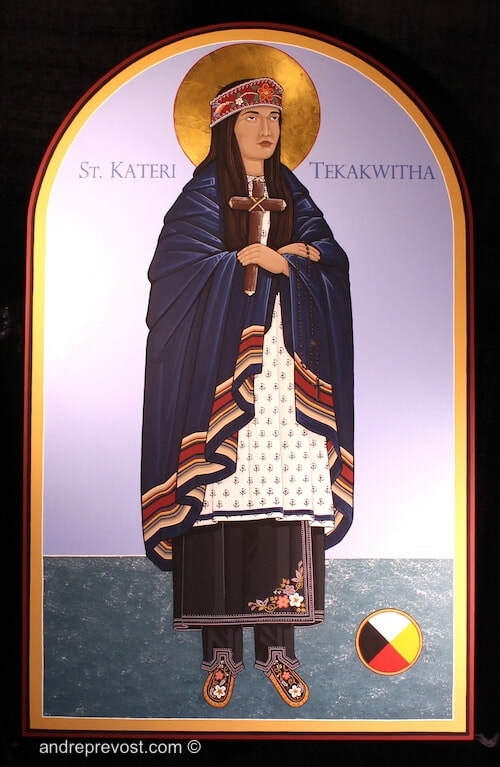 Now to return to the St. Kateri Tekakwitha icon which had already been started. 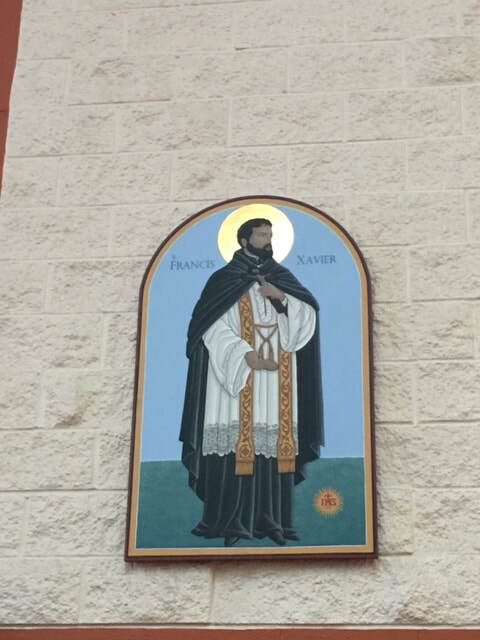 I had to then focus on the St. Francis Xavier icon to meet the deadline of his feast day. The icon is in its final stage. The next few days will be completing the garments and crucifix, followed by doing the face and hands. After some final touch ups, the plan is to varnish the icon by Thursday night or first thing Friday morning, in order to give the icon 4 days to dry and set. It is schedule to make its journey by ferry the morning of Nov. 27th. 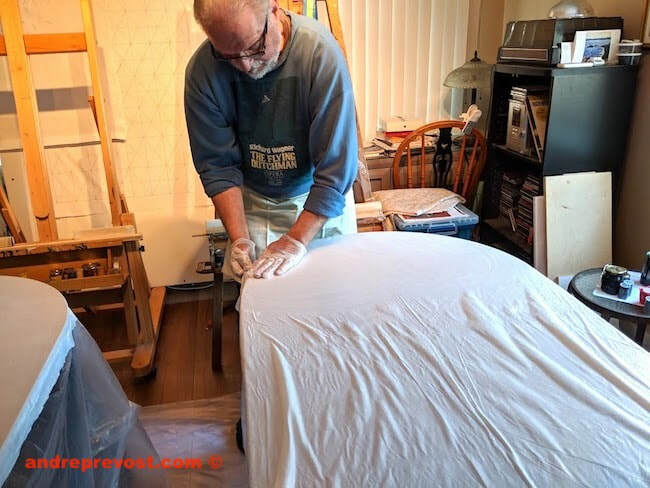 The deadline for the delivery of the St. Francis Xavier Icon is fast approaching, so I need to be organized in the sequence of how everything needs to be done. For example, I needed to get the halo gilded yesterday in order to give it as much time as possible to set. There is much still to be done, with the face and hands being last in the coming week. The icon will be delivered via the Duke Point Ferry either on the 26th or 27th. Blocking in base colours for the two icons. 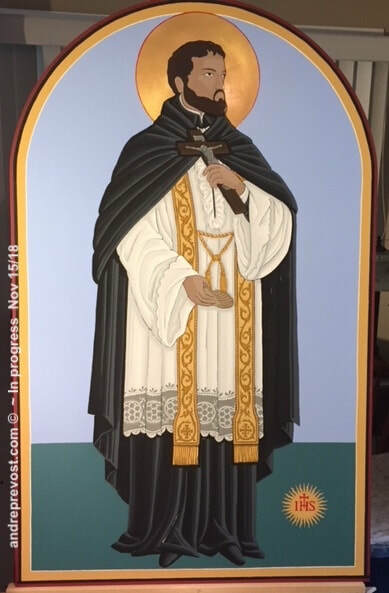 Once I have the two established, I will need to place all the focus on the icon of St. Francis Xavier as his icon needs to be installed in time for his December 3rd feast day. I also have the other 6 panels cut and ready when needed. 200 lbs of Baltic plywood sitting in the corner of my studio. 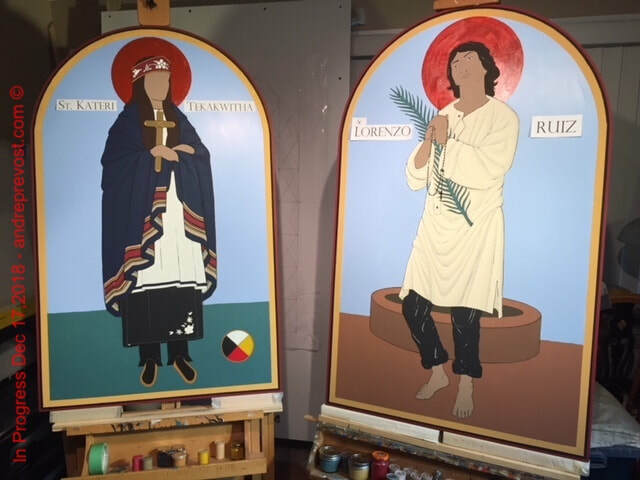 The drafting for the St. Kateri and St. Francis Xavier icons onto full scale grids was taken care of, and then transferred onto their panels. After more adjustments, I completed inking them in today. Not having any clear wall space that I can work the designs for the 8 icons of this size (30"x48"), and with the limited work space which was my living room, I had to construct a surface which could lean against the bay window end of the room; sitting on the floor and with extension to clear the vertical bind valence. This way. I can work out the drafting grid on the one sheet of paper, not having to redraft for each icon, and work the designs on vellum racing paper. 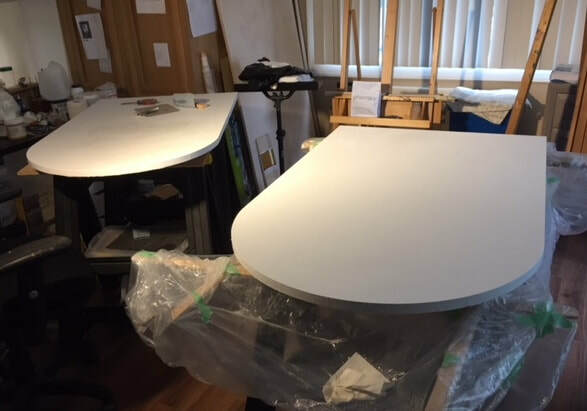 This also avoids not being able to erase corrected lines when you prepare the design directly into the gesso (which also leaves lines into the gesso). I'm in the process of preparing the first 2 panels for the commission. 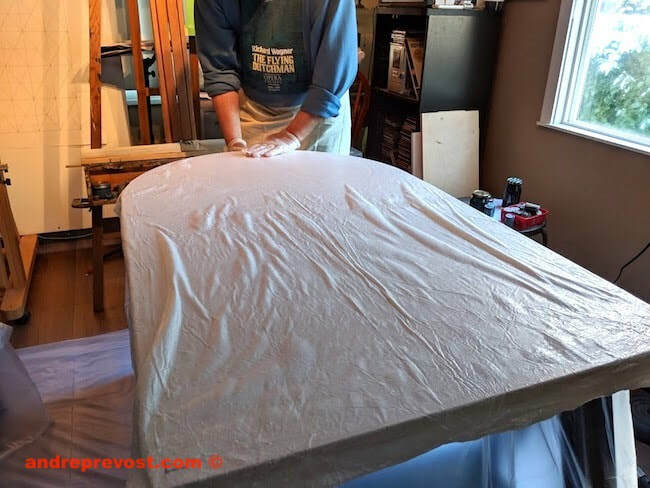 They are heavier because of their size and the rounded tops add some extra challenges in wrapping the muslin, but in spite of these challenges, and the limited space to prep two at the same time, and the cooler weather which slows the drying time, they are moving along. After another sanding tomorrow, I have another 5 coats of gesso to do. The commission from St, Monica Church in Richmond is underway. It involves 8 icons which will be written over the next 10 months. I picked up the cut panels yesterday, and I'm very pleased with the results. 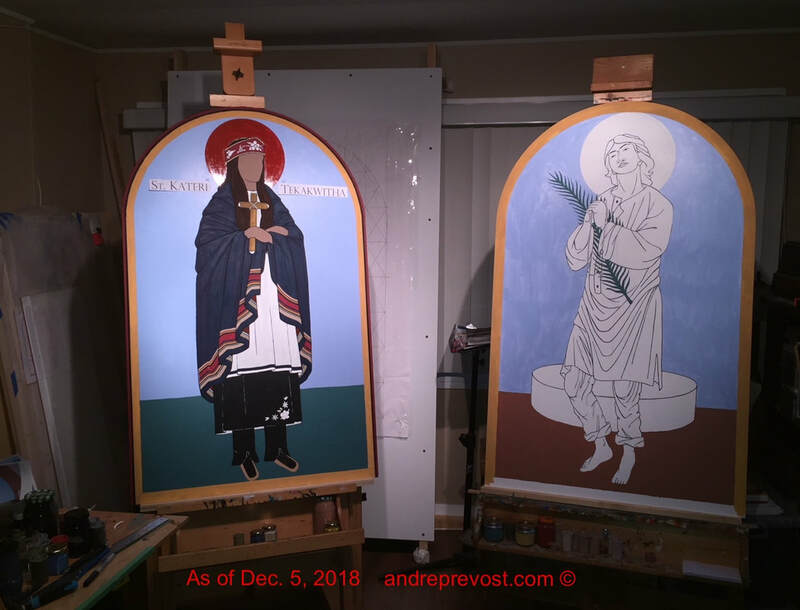 Because these icons will be hung along the textured cinder block walls on either side of the Nave, I am using 1" Baltic Birch Ply as the base as it is the most stable, and resistant to warping over time. The reason being, unlike regular plywood, it is constructed with 16 birch veneers which alternates the grain with each layer, explaining the weight and stability, and the added cost. The shape of each panel reflects the pattern on the wall themselves, rectangular but with a round top. It will pose a new challenge in wrapping the muslin along the rounded edge. The panels are 48" high and 30" wide. Adhering the muslin is never a pleasant task, having to work fast to get an even surface without air pockets, and getting clean side edges. One thing that may help in this case, is the muslin that I ended up with. I went into the fabric shop to get my usual muslin, only to find that the store is closing down (to relocate within the next few months) and their muslin was sold out... other then for one remaining bolt of the 'Premium Muslin' which was listed at $30 a meter (almost 3 times what I usually pay), but was fortunately 50% off because of the closing. 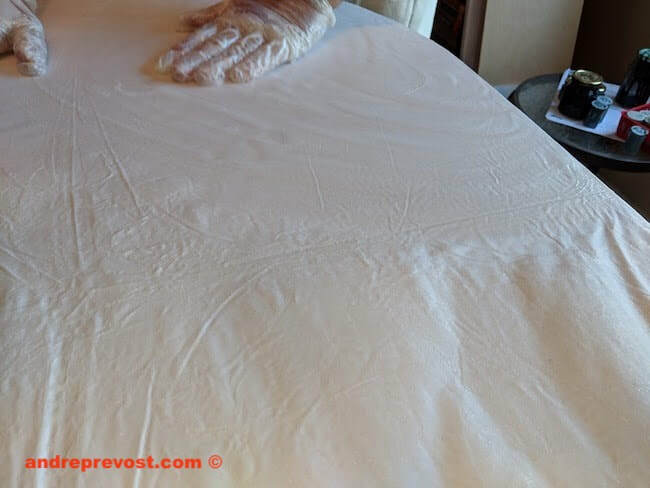 It almost looks like a fine white linen, and is has a double width which also helps. 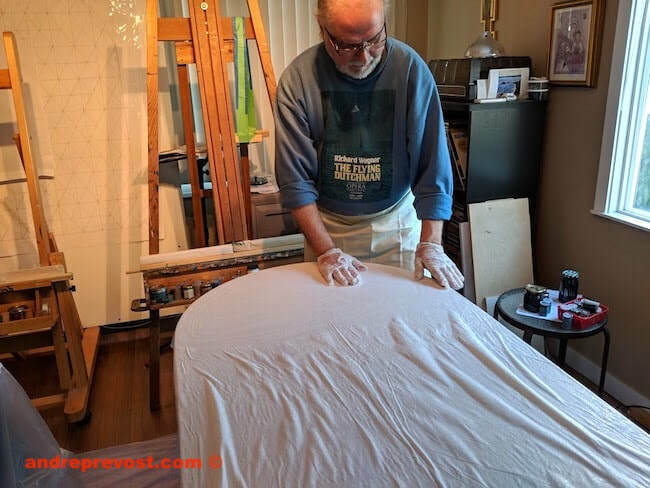 So I'm looking forward to see how it is to work with, although, it is a pity that such a nice fabric just end up under all the gesso and paint.